Whether your little girl is the perfect princess or a terrific tomboy, she deserves to have a memorable birthday that is as unique and special as she is. From mobile spa services to princess entertainers, KidsParties.Party has done the hard work for you and found some of the best themed entertainers and services for girls birthday parties in Salem County, New Jersey. Want to host a spa party at home for your daughter? Scroll below to find out how. Going to the spa is a great way to relax and treat your little girl to something special, but it can get expensive. Creating an at home spa-day is easy and affordable, so have your little girl invite over all her friends and give all of them the chance to get pretty and pampered. Check out some of the best spa party treatments you can do at home. 1. Mani/pedis: Get an array of nail polishes and let the girls get creative and do some fun nail designs. They can paint each other’s nails and get funky with designs, or just get a clear coat with a little buff for a more casual look. 2. Face masks: A relaxing face mask is a guaranteed way to make the girls feel extra pampered. Buy an inexpensive face mask from the store or learn how to make your own. 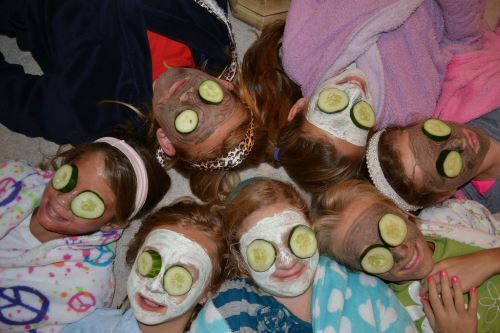 Just cut up some cucumbers to put over the eyes and let the girls lay out, relax and enjoy the pampering. 3. Hair styling: Your home spa can double as a hair salon. Keep the scissors in the drawer, but everyone can practice braiding and styling hair. Older girls can try their hand with the straighteners or curlers. 4. Fancy foods: Lemon water, herbal tea and fresh berries are all delicious menu options to serve at your little spa party. Infused water and tea make for a refreshing beverage, while berries are the perfect snack to enjoy while waiting for your nails to dry. If you’re not up for turning your living room into a miniature girl’s day spa, KidsParties.Party features entertainment services in Salem County, New Jersey that specialize in parties for girls of all ages. Is your daughter just not into princesses and pink? Check out our article that features services across the country that offer hands-on science parties where girls can build robots, learn to code, discover fossils and so much more. We would love to get you listed! Sign up today to get started with this quick and simple form.